or 6 interest free payments from $1.01 with LAYBUY - Whats this? These rustic inspired invitations are inspired by both the bride and the groom, featuring a pair of sketched deer antlers on top of a beautiful bunch of purple roses. The invite is pictured here printed in black and charcoal tones onto a kraft/brown rustic-look card. Elegant text and traditional styling inside mean that this is the perfect invitation for a wedding which embraces the relaxed style of the country, but still acknowledges and celebrates the formality and tradition of a wedding day. These rustic inspired invitations are inspired by both the bride and the groom, featuring a pair of sketched deer antlers on top of a beautiful bunch of purple roses. The invite is printed in black and charcoal tones onto a kraft/brown rustic-look card. Closed this wedding invitation measures 105 x 148mm. On opening the invitation, you are greeted with the main wedding invitation, and a pocket for extra information cards. The cards pictured here included a map of the venue, accommodation information and a wishing well poem. 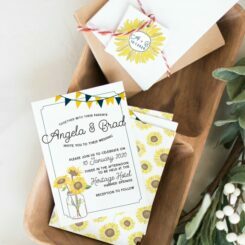 As with all Be My Guest wedding invites, colours and fonts can be altered to suit your unique wedding style. You’re also able to add on extra information cards, and order reception stationery to match.